Spicy Mexican Hot Chocolate is the perfect drink to warm you up on cool Fall and Winter days! Begin by gathering your ingredients. Now, you have some decisions to make. Masa harina comes in two forms: finely ground and coarsely ground. After making this a few times, I have found the best way to get the perfect texture is to use one tablespoon of each. The finely ground gives the hot chocolate its creaminess while the coarsely ground adds a textural component that I appreciate. It’s up to you! To make this drinking chocolate, begin by pouring the two cups of water into a saucepan and bring it to a boil along with the cinnamon stick, star anise, cloves, and the sliced chilies. I made mine with serranos, which are like a hotter version of jalapeños, but you can use whatever chili you like or omit the heat altogether. It might be fun to try a smoked chili like ancho or chipotle for a different flavor. Reduce your saucepan to a simmer and allow the ingredients to steep for about 10 minutes. Remove the chilies and spices so that you just have the flavored water remaining. Return the saucepan to a medium heat. Next, whisk in the cornmeal, whichever variety you selected, and continue whisking until the liquid starts to thicken. This takes a few minutes. Add the cup of milk, brown sugar, and chocolate, continuing to whisk until you have a creamy hot chocolate mixture. It’s now ready to serve! 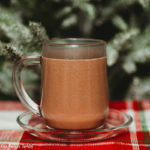 This Spicy Mexican Hot Chocolate can be served early in the morning with breakfast or a late night dessert to warm up!